You are here: HomenextTopicsnextViews of the city: images & opinionsnextMystery photos of Brighton and HovenextA Workers' Protest? I do not know what the occasion was in this photograph, but my Father is in this group. He worked in the Brighton Steam works until its closure. He was a member of the National Union of Railway Workers so this could be a protest march or strike march. Can anybody identify the occasion, the people and the banners? I don’t know for sure but I would put this incident somewhere in the 60s and in all probability about the Beeching axe that closed so many branch lines. Could be to do with one of the trade union or political party conferences. It looks to be mid 1960s. Beeching lasted from June 1961 to May 1965 as Chairman of The British Transport Commission. In that time he started the short sighted run down of the railways on a vast scale, some of which was necessary but some must be without doubt regretted today with the increased traffic on the roads. This march could certainly have been a protest about the Beeching cuts perhaps timed with a party conference. The tragedy of the cuts was the loss of 9,000 miles of well engineered rights of way that could be used today to alleviate traffic congestion on our roads. I wonder about the costs of the cuts versus the cost of extra roads including new by – passes and the effect on the countryside. Clearly there was no proper plan for a transport system of the future. 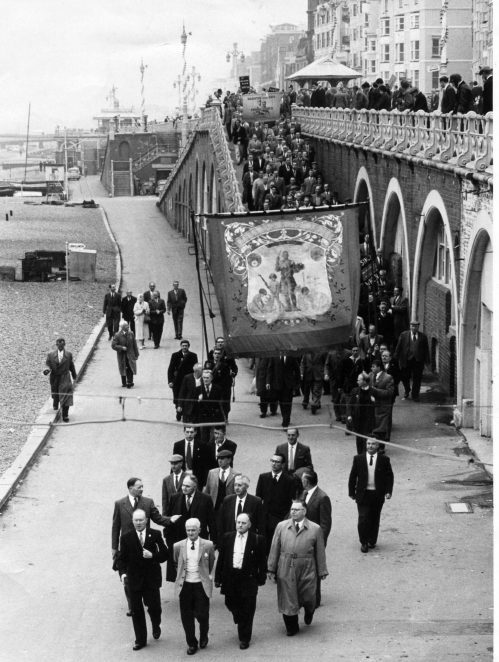 Looking at the foremost banner in the photo, which has Brighton & Hove written on it, it actually has a similar look to some Workers of the World Unite banners. However opposition from the pressure groups failed and during the 1960s, 2,128 stations and more than 67,000 jobs were lost. In 1965 I remember moving from Brighton to live at Upper Beeding and soon after that the local line through Bramber was closed. Looks like they were heading down to Fishmarket Hard to hold a meeting or demonstration. Has anyone tried looking in the Argus archives? Perhaps this was reported. The photo shows railway men demonstrating against the proposed closure of the Lancing carriage works. The photo and report appeared in the Brighton Herald, 6 October 1962.